As the first line of defence against blazes in the UK capital, the London Fire Brigade (LFB) regularly attends some of the most gruelling and stressful incidents imaginable. These are not confined to fires, however: the LFB also undertakes land and riverine rescues (excluding underwater tasks), especially in the event of flooding. In 2017, the LFB responded to 6,256 flood-related incidents in London, mostly caused by excessive rainfall and burst water mains. Its role is particularly crucial when it comes to rescuing children, elderly persons and those with restricted mobility, as well as persons who may be trapped inside vehicles. Consequently, the LFB currently maintains 10 units dedicated to water rescue, all of which have access to small response craft. 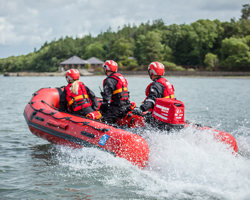 Most recently, the brigade has bolstered this fleet with a new rescue boat developed by Survitec. More commonly used by military and police customers, the DSB GP 470 FR is a portable, inflatable boat designed to be deployed in shallow water. The model supplied to the LFB has an overall length of 4.7m and an inflatable floor, weighing just 94kg when empty. The DSB GP 470 FR model also offers the option of wooden segmented, aluminium segmented or roll-up floors, depending on client requirements. Mark Hart, sales director for Survitec’s UK commercial marine activities, tells Ship & Boat International: “The boat is constructed using a heavy-grade [1670 decitex] neoprene/Hypalon, which is a proven, UV-/abrasion-resistant material for military boats. This material is superior to other boat fabrics, such as PVC and PU." The craft can accommodate up to 10 crew and a maximum payload of 1.42tonnes, and offers 2.93m³ of usable floor space. Hart continues: “The DSB GP 470 FR features a rapid inflation system that links the whole boat to a single inflation point.” As a result, it is possible to remove the boat from its carry-case, inflate it and have it on the water in less than four minutes, he adds. The boat is controlled by a tiller. “Steering and joystick controls would have added weight and restricted portability and packing,” Hart explains. The buoyancy conferred by the lightweight inflatable floor design and the craft’s deep-V-shaped, inflatable keel should provide ample manoeuvrability in tight spots and emergency situations, he adds. Outboards were not supplied with the LFB’s order: while the DSB GP 470 FR can incorporate up to 44kW of motorisation max, the LFB will power this boat with a Mariner motor. “With three persons on board and a 30kW engine, this model is capable of achieving a speed of up to 20knots,” Hart says. Although obviously dependent on the craft’s load and outboard shaft length, the DSB GP 470 FR’s draught is in the region of 600mm – though, if equipped with a tilted engine, 400mm is possible. In terms of operational range, Hart says that a standard portable, 25litre fuel tank should yield up to four hours on the water. Further Survitec deliveries to the LFB are expected, Hart says, revealing that the contract includes options for additional rescue boats – which, if exercised, would probably be delivered in late 2019 and early 2020.